Accidents happen even in the most unexpected time of the day. Children and infants are more prone to these accidents because of their vulnerability. Good thing there are parents to look after their young ones. But if you think of it, what really happens when a parent, specifically, the mother, leaves her infant alone with a toddler? 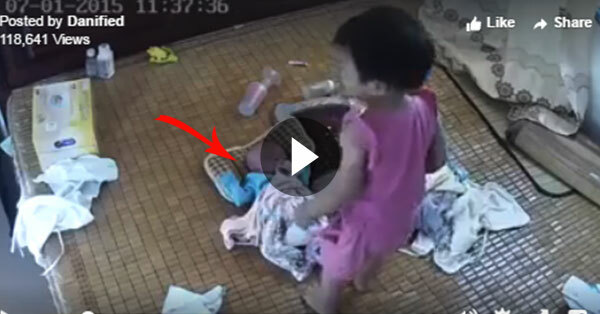 A CCTV video captured a hair-raising incident of a toddler with the infant victim. In the said video, there are two babies lying in their bed and an older child was with them. No adult was seen nearby. As one baby cries, the older kid took her sibling without hesitation. They fell down afterwards. The baby continued to cry as he was obviously hurt. So the older child took the baby again, for the second time. Until their mother came, with obvious anger on her face. Who is at fault in the incident? It is very common for children to imitate the things that older people do. As for the older child in the video, she only tried to pacify her sibling who is crying vehemently. She did not exactly know what she is doing. Their mother should have seen the circumstances beforehand especially since she knew that her toddler is fairly innocent and knows nothing. Toddlers should not be left alone with an infant to avoid incidents like this and parents should act keenly when it comes to taking care of their babies. As of the moments, there are no reports regarding the exact condition of the baby.